In Memory of Chas. Knapp And In Honor of His Daughters, Aged 90 and 86 Yrs. LEEDS, Me., Aug. 5 (Special) -- A reunion was held at the Charles Knapp homestead in Leeds today, a tribute to his memory and in honor of his youngest living daughters, Miss Catherine L. Knapp and and Mrs. L.J. Pollard, aged 86 and 90 years. The guests of honor were Mrs. Emma Stanchfield McMahon of Luddington, Mich. and Mr. and Mrs. Geo. T. McMahon of Detroit, Mich.
After a pleasing program, followed by a picnic dinner, the remaining hours were spent in happy converse. The lives of this worthy pair are studded with gems of kindly deeds, noble abnegation and a loyalty to duty, well deserving of praise and perpetuity. 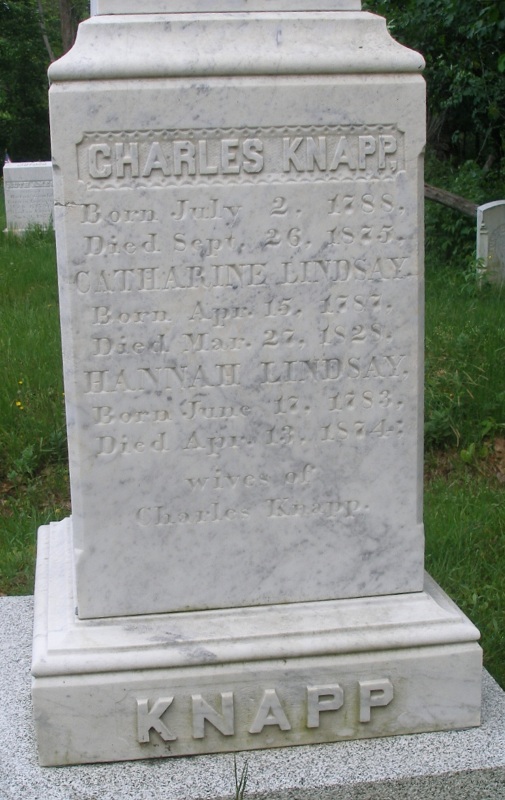 Charles Knapp was of Puritan ancestry, and one of a large family of children, all becoming worthy men and women of our good old State of Maine, and in some instances, publicly honored. Among them---and self made men---is the late Cyrus Knapp of Livermore Falls, his nephew, and Charles B. Knapp, his grandson--son of the late Archibald, who at present holds the position of superintendent of schools for the towns of East Livermore and Jay. He married Abigail Lindsey and soon located on the North road at Leeds center, on what is one of the best farms in town. His first wife bore him six children who lived to grow up. The oldest, Azel, became a pioneer preacher in the new Middle West, where he was much esteemed. Archibald married and settled in East Livermore, Sewall, the youngest boy, married and remained at home with his father. Abigail married Isaac Stinchfield of Leeds. 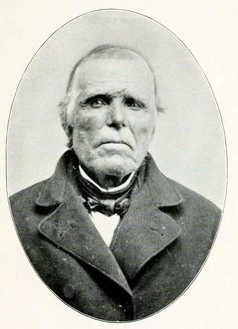 Calista married Samuel Leadbetter who located to Penobscot County where he engaged in farming, lumbering and the milk business. Hannah, an old-time school teacher, married Barnabus Davee of Leeds, after whose decease she became the wife of Mr. L.J. Pollard. Her prestige is well known. Catherine was born of Hannah, the second wife. She, too, became a teacher of marked ability. Duty, however, compelled her to remain in the old home, where she has ever been loyal to her trust. All were possessed of virtue in a marked degree. Charles Knapp was a genius of his time and generation. Of a rugged constitution, his determined will lead where few could follow. He knew no adversity too great to be overcome, he knew no fate, he asked no need. Thru his study nature, and a heart that sought the good of all, he was stamped a man than whom for honest endeavor and achievement none are superior. He was "Uncle Charles", and all friends and relatives alike enjoyed his hospitality. Many a boy of a poorer realtive found a home at his fireside, to be taught the way of industry and well-being. His motto was: "Help others to help themselves." He helped where and when, as he believed would be best. Even in one instance giving a young man in whom he took especial interest, the late Charles Knapp Hutchins to whom such glowing tribute was recently paid by his Winthrop friends, a college education; he becoming a lawyer of ability, but a promising career was cut off in the giving of his life for his country in our civil war. He accumulated a large property, while in life gave to his children, and numerous were to the relatives whom he bridged over hard places thru loans. He may fittingly be styled a benefactor to his kindred. He was deceased in 1874 at the age of 86 years, having toiled to the very last, and having so served nature that nature could the better service give. Earth has his life -- his laurels, heaven. At the reunion today, the following lines, written by Charles Knapp Leadbetter were read, "Commemorative of his maternal grandfather, Charles Knapp, Leeds, long since deceased, and a memento to his two youngest living daughters, Catherine and Hannah, aged 86 and 90 years; ascribe them as a legacy to his descendents, and lovingly and respectfully dedicate them to my children--Shirley Francis, Master Wyland Fenway, Mrs. Rena May McElroy and Mrs. Verna Fae Knapp." Such tokens as we know will last? Across the threshold of life's day. We see, and fitting homage pay? In loving words and deeds to grow. Thru kindness, love and tender care. To us a heritage most dear. While you are waiting on life's shore? Brave hearts!--your names will ever live! Where all will meet in heaven again. The summons to the fairer shore. All honor to our worthy kin! Sought out a way in life to win. A home that many a kindred knew. As if possessed of magic hand. The ripened harvest of the land. Who rest with him in heaven. In full, in faithfulness, in care. As in those favored days of yore! Of honored fellowship once more! • He appeared on the census in 1850 in Leeds, Androscoggin County, Maine. He was head of household and his real estate was valued at $300. Elizabeth Gould lived in the household, aged 63. • He appeared on the census in 1870 in Leeds, Androscoggin County, Maine. He was head of household. • He was buried at Dead River Cemetery in Leeds, Androscoggin County, Maine.